Opening an existing project in QuarkXPress is no different from opening a file in any other application: From within QuarkXPress, choose File →Open and navigate to the file. But QuarkXPress also has a handy Welcome screen that appears when no project is open, or when you choose Window→Welcome Screen. Open a Recent Project: Lists your most recently opened projects. Click one to open it. To open a different project, click the Other Projects folder icon. This opens your computer’s standard Open File dialog box. Create. . . : Lets you create a new project or a new library. Resources: These Quark-related online resources are updated whenever Quark feels the need to change them. Click a resource to be taken to its web page. 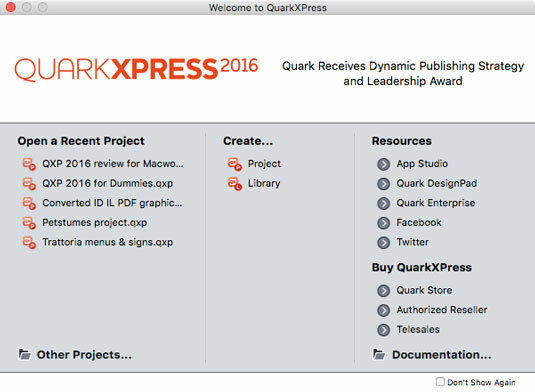 Below the Resources section is a list of ways to buy QuarkXPress. You also find a handy Documentation folder icon that opens the folder on your hard drive containing the QuarkXPress Getting Started reference PDF (in many languages) along with comprehensive documentation for creating AppleScript scripts (if you’re on a Mac). On a Mac, the File menu in QuarkXPress has a handy Open Recent item that lists recently saved QuarkXPress projects. To make a similar feature available in Windows, QuarkXPress includes the DejaVu XTension, which is installed automatically. To adjust the number of items it shows, choose Edit → Preferences and click the File List pane. If you find yourself repeatedly opening projects, saving projects, and retrieving text and pictures from the same folder, you can also use DejaVu to designate default folders for those actions. That way, whenever you choose the File→Open, File → Save, File → Import, or File→Export commands, the resulting dialog will already be directed to your chosen default folder for that action. To assign default folders, choose Edit→Preferences and click the Default Path pane.